Hanafi Fraval reports from Los Angeles. After some years of trying, the Subud LA centre is being outwardly revitalised through enterprise. 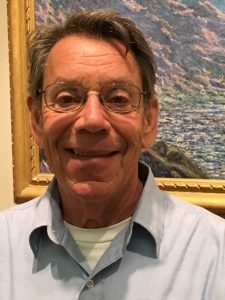 This is a success story about a Subud group that has seen four major changes over the past two years. It is a ‘centerprise’, if you will, that uses an entrepreneurial approach. 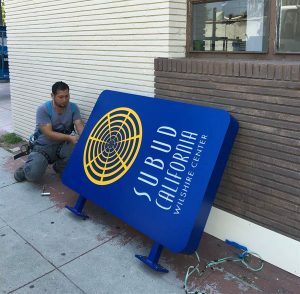 Two years ago, Subud Los Angeles was struggling to pay its expenses and the maintenance of its landmark building. In fact, most months Subud LA was losing money. We were renting the ground floor, primarily to Alcoholics Anonymous groups. As there are no enterprises in the group, most of our financial burden fell upon our membership. Paint was peeling away from the outside walls of our building. The windows showed serious rusting. Whenever it rained, the roof leaked profusely. 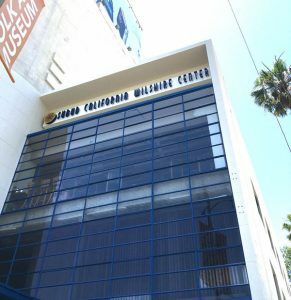 But we are situated in one of the most desirable locations in the city, opposite the La Brea Tar Pits and the Los Angeles County Museum of Art (LACMA), which are among the destinations that create ‘Museum Row’ on the Miracle Mile. 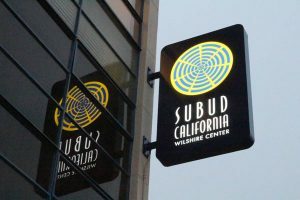 It is a prestigious location, but there was nothing on our building to identify it as a local Subud center. Then Luqman Katz was elected chair. He and a small committee continued the search begun by the previous committee, to find a tenant for our ground floor. They communicated monthly progress to the group, and it was not long before Luqman told us about a startup company that wanted to rent the ground floor. The startup is an app company; that is, a company developing apps for smartphones and computers. They were in a fund-raising mode. Luqman stuck with them over a protracted one-year period, patiently negotiating our lease contract. Jane Katz’s daughter brought in a lawyer friend to help negotiate and write the ground-floor lease. We saved $2,500 through the generosity of the attorney, who happened to be a specialist in community real estate law and provided these services without charge. The property management committee of the region was an enormous help, too. The tenant moved in and, over the course of the past year, has spent $45,000 upgrading the ground-floor space. It looks fabulous. And the rental income makes the group sustainable from the end of 2016. The second project was to get our building watertight again, and the committee went about inviting bids for a new roof. Through this process, a contract for $16,000, plus interest, was awarded, funds were raised and we now have a completely new roof. The third project relates to signage. I have read so many stories about people who just heard or saw the word Subud and suddenly knew they had to find out more about it. Yet, our building was completely nondescript, without any identification visible to passing traffic. Fourteen years ago, Lorenzo and Henrietta Music and family had donated some $8,200 to the group for a sign. Somehow the sign was never put up (don't ask), but the $8,200 had been kept safely in an account by Subud California, and Henrietta later added another $3,000. Aswan Karapedian designed the signage, and several possible designs were put to the group for comment and approval. In the end, the group selected an attractive blade sign and a parapet sign. The blade sign is internally lit and is attached to the side of the building. It protrudes towards the road, making it highly visible to passing traffic. The parapet sign is a 25-foot-long, back-lit sign that runs along the top of the building. Luqman invited bids that ranged from $16,000 to $45,000. He was about to award the contract to the lowest bidder, when that contractor withdrew. In the end, he and Aswan found another company willing to do the job for $18,000. Meanwhile, the committee actively sent out appeals to a number of individuals and groups around the country. Thanks to the generosity of many donors, we were successful in raising the needed money. 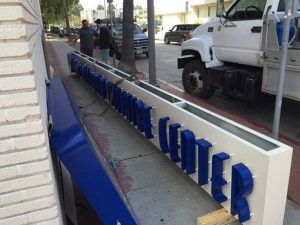 Finally, the contractor installed the signs in June 2016. Just days after, a couple, who had seen the signs and live only blocks away, walked in off the street and inquired about Subud. The fourth (and current ongoing) project is to repaint the building, which has extensive window areas in the Art Deco style. Again Luqman searched for contractors, eventually finding one that bid $31,000 and was willing to break the job down into the front area, with the side and rear of the building to be painted later. Luqman managed to negotiate the painters down to $13,000 for the front, and again the committee managed to find the funds from many generous donors. The second phase of painting is now ready to go, and we have a bid of $16,500 for that work. Already $12,800 has been raised, leaving just $3,700 left to find. We are nearly there, yet the last few dollars are often the most difficult. 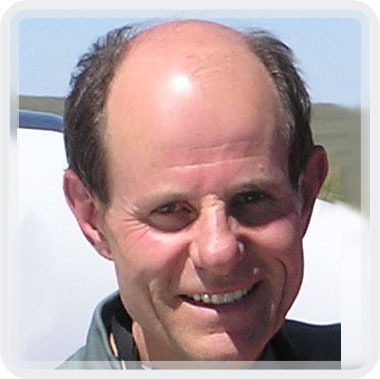 Having said that, successfully finding a good tenant, leveraging the revenue from that tenant, and generating renewed self-confidence and self-image among the membership of the group has been transformative. Success breeds success. And future projects will contribute to the restoration of our fine building. In two years or so, the long-awaited Metro Purple Line will be installed, serving LACMA and the city. This will dramatically affect the property values along the line, as our building is located very near the LACMA stop. Next year will see stable finances and a flourishing group, thanks to these initiatives. Four years ago, the building was valued at $2.8 million. Who knows, by 2018 its value may have escalated to perhaps $5 million as a result of these developments.